In most Nigerian homes, there's one common ingredient you'll likely find and that ingredient is palm oil. It's a rich edible vegetable oil gotten from the palm fruit. 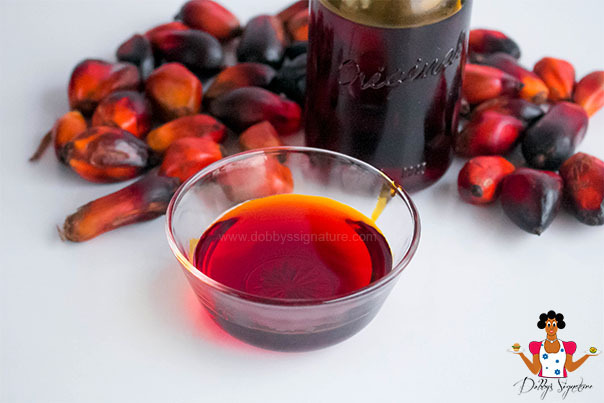 3) Palm Kernel Oil: Bleached, Neutralized, Deodorized Oil. This is processed from the kernel. After the processing of the fresh kernel fruit to yield palm oil, the shelled inner palm kernel nut is then cracked to yield the palm kernel fruit which is crushed and processed into palm kernel oil. This is used in the production of vegetable oils, soaps, creams and candles and not suitable for human consumption therefore mainly used for soap making. In most Nigerian homes, there's one common ingredient you'll likely find and that ingredient is palm oil. In this tutorial, we'd be learning more about palm oil. As stated above, palm oil is a popular product from the palm fruit. It's a rich edible vegetable oil which is rich in Sterols, Vitamin E, Antioxidants(Flavonoids & Phenolic Acid), Carotenoids such as Alpha & Beta-carotene, Lycopene. It has a reddish - orange colour and is used in preparing various dishes such as soups, stews and local salads and appetizers. 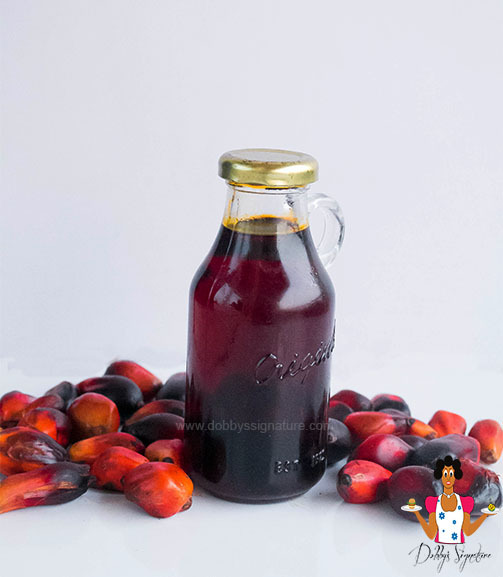 Step 1: To make palmoil, you have to start by extracting the juice from the fruit as shown HERE. Step 2: Next, you place the juice in a pot and boil till the oil rises to the top. Step 4: Bottle and store the palm oil for cooking. When "bleached" it's used in frying or as a base for certain stews and when further refined after bleaching, degummed and deodorized (A process which strips off basic nutrients such as carotenoids), you get a common commodity or better put, vegetable oil known as palmolein. Filteration & Bleaching: This is done to remove the colour and smell to produce deodorized palm oil (RBDPO) and free fatty acids. The oil from this process is then sold in the commodity markets for use in the manufacture of soaps or further refined to produce cooking oil. The highly saturated nature of palm oil makes it solid at room temperature. This is what is then used to make margarine, a cheap substitute for butter.